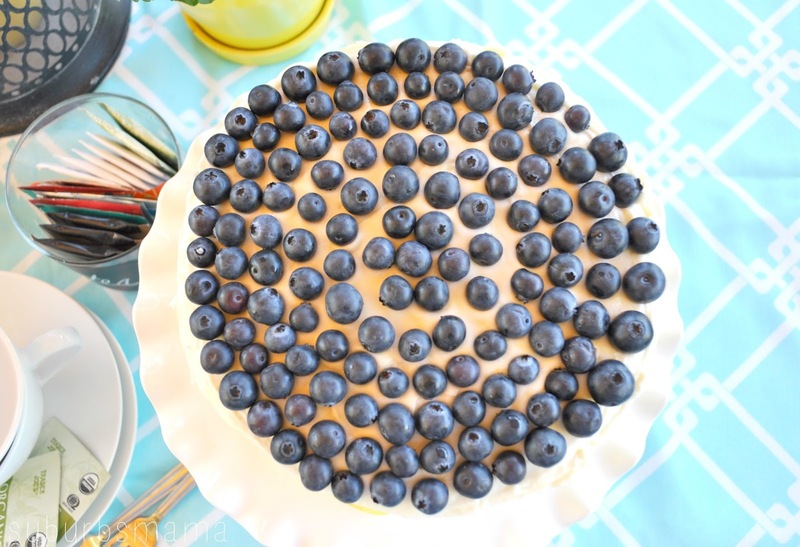 When I think of summer, I think Blueberries! It's no secret that blueberries are a favorite in our house, we go picking at least two times during the summer, The kids love it! We eat a ton and freeze a ton for baking and snacking. When I saw this recipe, I just knew that I had to try it. I mean blueberries and lemons?! Can there be a better combination for a summer cake? 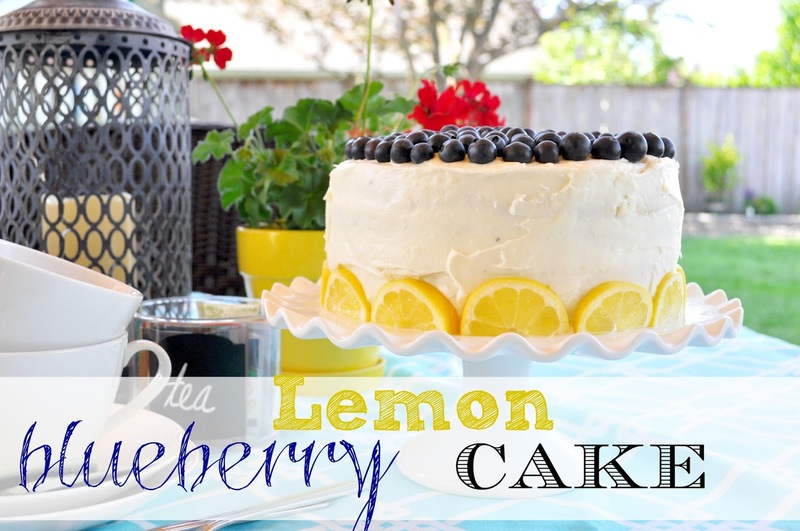 I love the combination of the lemon and blueberries, and the cream cheese frosting? YUM! It is full of flavor and so moist and soft. I can not wait to make it again with some fresh farm blueberries. Preheat oven to 350 degrees. Butter 4 9-inch round baking pans and line the bottom of each with a round of parchment paper. Butter parchment paper and lightly dust pan with flour, shaking out excess. Sift cake flour into a mixing bowl. Add all-purpose flour, baking powder, baking soda and salt and whisk for 30 seconds, set aside. In the bowl of an electric stand mixer, fitted with the paddle attachment, whip together butter, granulated sugar and lemon zest until mixture is pale and fluffy. In a 2 cup liquid measuring cup, measure out milk then stir in sour cream and lemon juice, let rest 3 minutes. Meanwhile, mix eggs into butter mixture one a time, then stir in lemon juice and vanilla extract. Toss blueberries with 3 Tbsp of the flour mixture. Working in three separate batches, beginning and ending with remaining flour mixture, add 1/3 of the flour mixture alternating with 1/2 of the milk mixture and mixing just until combined after each addition. Gently fold in blueberries. Divide mixture evenly among prepared baking pans. Bake in preheated oven until toothpick inserted into center comes out clean, about 27-30 minutes. Cool in baking pans about 20 - 30 minute then invert onto wire racks to cool completely. 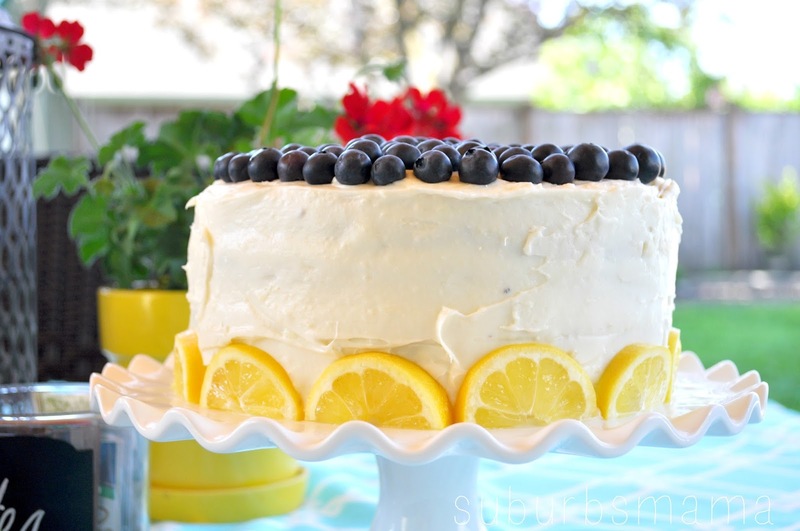 Once cool, frost with cream cheese frosting and decorate with blueberries and lemon slices if desired. Store in an airtight container. In the bowl of an electric stand mixer fitter with the paddle attachment, whip butter until pale and fluffy. Add cream cheese and mix until smooth and fluffy. Add vanilla and lemon extract and powdered sugar and blend several minutes longer until smooth and fluffy (if frosting seems slightly runny, you can chill it for a bit before frosting cake). The cake looks so good. 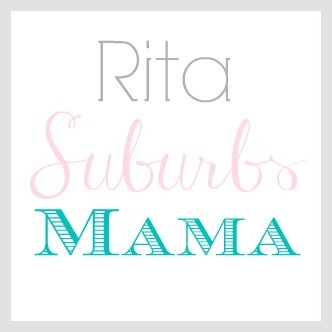 Too bad I can't bake to save my life, so I can only drool over your yummy photos! wow.. Looking yummy. Thanks for sharing this recipe. 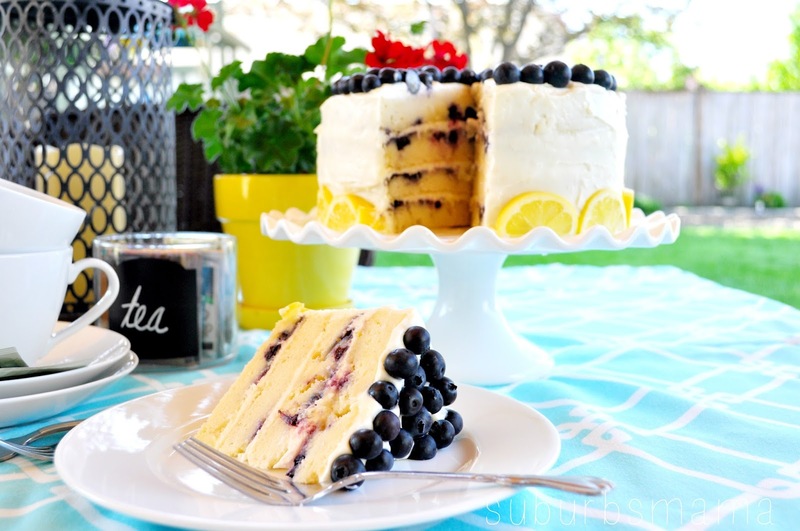 Blueberry Cake is best is summer season. Its my favorite cake.